Todays lesson in the course The Catholic Church and the Jewish People from Vatican II to Today has, as one can see from the title, two themes and three speakers. From 1977 to 1986 I was the Secretary of the Commission for Religious Relations with the Jews, and as such I am going to present the first theme: the establishment of the commission, its origin, but also its work during those years, which had important repercussions on what happened later. The Commission for Religious Relations with the Jews was established by Paul VI on October 22, 1974, exactly thirty years ago. Hence todays commemoration. One ought to remember that the creation of the commission is in a certain sense a point of arrival, as well as a starting point. It seems to me therefore that todays lesson could be divided into three parts, not merely for didactic reasons, but also so as to organize properly the presentation of the topic. These three parts are: 1) the precedents of the Commission and its beginning; 2) its configuration in the context of the Roman Curia; 3) the chief moments of its work between its creation and the end of my period as Secretary; thus, between 1974 and 1986. The Commission is not the absolute beginning. Already before 1974, during the Second Vatican Council, the theme (which was certainly very difficult and the object of many discussions) of the relations with Judaism had come to the fore when the Fathers were preparing the document which today is known by its first Latin words Nostra Aetate. This document mentions the problem of the relations with Judaism only in paragraph number four, which is the penultimate; earlier on, the text speaks of the other non-Christian religions. It appears therefore that Judaism is not considered differently from other religions, with the exception of its presentation in the famous introductory statement where we read: Considering the mystery of the Church, this sacred Council remembers the tie that spiritually unites the people of the New Testament and the descendants of Abraham. The rest of the paragraph continues in the same tone. In the debate preceding the redaction of the document, especially in various interventions by Cardinal Augustin Bea and other Council Fathers, the special character of Judaism and of its relations with the Catholic Church had also been emphasized. For this reason, when Pope (now Blessed) John XXIII had decided to create the Secretariat for Christian Unity as a preparatory organ for the Council, the question of Judaism and of its relations with us had been entrusted to its President, Cardinal Augustin Bea. This must be noted carefully when we consider the subsequent developments. From that moment onwards, the relations with Judaism were kept distinct and separate from relations with other religions, and this despite the structure and the thrust of the Declaration Nostra Aetate that I mentioned a moment ago. When later the Secretariat for Christian Unity became an organ of the Roman Curia, or, in other words, a dicastery, the relations with Judaism remained within the ambit of its competence, even if in the meantime another dicastery  known today as Council for Interreligious Dialogue  had been created to handle the relations with non-Christian religions. This dicastery would then handle all non-Christian religions, with the exception of Judaism. This must be kept very clearly in mind, since within the Secretariat for Christian Unity almost from the very beginning was also established an Office with the specific task of handling the relations with Judaism. This Office was entrusted by Cardinal Bea to Professor Fr. Cornelius A. Rijk, who was therefore the first one at the Holy See to be responsible for the relations with Jews when these relations were an absolute novelty and therefore had still to find their own way. Fr. Rijks work was pioneering and I am glad to remember here his name and his achievements, independently of his limits. All of us who came later are, in one way or another, in his debt. The task of Fr. Rijk was twofold. On one hand, under the supervision of Cardinal Bea, he had in some way to institutionalize within the Holy See the absolutely new relations with Judaism. On the other hand, he had to prepare some guidelines so that the Catholic Church and its central governing bodies, as well as the national Episcopal Conferences, could establish these relations, which were equally new, or in fact totally alien for the great majority of the worlds episcopate. One can then easily understand the difficulty of both tasks. And in fact there was yet another difficulty: how to choose the right interlocutors within Judaism, which is a complex and certainly not monolithic reality. This became easier after 1970, after the creation of the organ known as IJCIC -an acronym indicating the initials of the International Jewish Committee for Interreligious Consultations that included representatives of the main Jewish organizations- and of its International Liaison Committee that dealt with the relations between the IJCIC and the Secretariat for Christian Unity. In order to tackle the two tasks mentioned above, it was immediately thought necessary to compose an official document that could facilitate the application of the content and of the new, more open attitude of Nostra Aetate. To prepare the composition of this document a first meeting of experts took place in Rome between April 9th and 12th, 1969, some time after the creation of the Office for Relations with the Jews. Work towards this document continued in the following years, also with the participation (which, one could say, was after all their duty) of the bishops who were members of the Secretariat for Unity. In the meantime, however, the Commission for Religious Relations with the Jews had been established in October 1974 and to this Commission it eventually fell to promulgate this document, under the name Guidelines and Suggestions for the application of the Conciliar Declaration Nostra Aetate, on December 1st, 1974. This document would effectively become the charter of the new Commission. 2) The Commission: Its Place within the Roman Curia and Its Structure. The creation of such a commission was a novelty in the Roman Curia and is one of the merits of the great Pontiff Paul VI to have made this decision in an institutional context, in full continuity with the theory of dialogue expounded in his inaugural encyclical Ecclesiam suam. At the same time, the Pope had created a parallel Commission for Religious Relations with Islam within the Secretariat for Non-Christians. Thus the pre-existing Office became a Commission with its own identity and structure. In connection with this, it is necessary to note three things. A) The Commission, like the earlier Office, has remained within the Secretariat for Christian Unity (today the Pontifical Council for Promoting Christian Unity). If therefore Judaism can be considered a non-Christian religion, it is not so in the same sense as the other religions to which this label can be applied. Its relation with the Catholic Church and, more in general, with the reality of Christianity is completely different. It was this consideration that led to the decision to establish this Commission not within the Department that handles the other religions, but within the Department that deals with other Christian denominations. Maybe this solution is not the best since it might create the misunderstanding that the goal of these relations is the establishment of a unity, as with other Christians; and this, as is now clear, is absolutely not the case with Judaism. From another point of view, however, there is a true relationship between ecumenical commitment in the strict sense and the relations with Judaism, at least in the sense that this relation is a vocation shared by all Christians and thus can truly help their mutual reconciliation. B) The Commission, however, unlike the earlier Office, is distinct from the Secretariat (todays Pontifical Council), but is connected to the latter (these are the terms used in the document that established the Commission). It thus possesses its own structure that coincides in part with that of the Pontifical Council, and shares the same President, who, after Cardinals Bea, Willebrands, and Cassidy, is now Cardinal Kasper. The secretary of the Pontifical Council is instead the vice-president of the Commission, His Excellency Mons. Brian Farrell, who succeeds Mons. Charles Moeller, His Excellency Ramón Torrella (the recently deceased former Archbishop of Tarragona in Spain), Mons. Pierre Duprey, and briefly His Excellency Mons. Marc Ouellet (today Cardinal Archbishop of Québec). The Commission has its own secretary, today the esteemed Fr. Norbert Hofmann, who succeeds (in chronological order) Fr. Pierre Marie Stanislas De Contenson OP (about whom I shall have more to say), myself, Fr. Pierfrancesco Fumagalli (who is present here today), and Fr. Remi Hoeckman OP, who is now retired and returned to his home country of Belgium. C) The mandate of the Commission has, from its inception, explicitly referred to the religious relations with Judaism. One might ask what is the meaning of this adjective attached to the name of the Commission and how one ought to interpret it. I would like to say that this is not necessarily a limitation; on the contrary, it is perhaps a liberation: Judaism is a religion, and a world religion, in the sense that it is present on all continents; one can say that it has a truly universal vocation, if not perhaps a missionary one. Judaism, however, presents itself as having a special relationship with a state, the state of Israel, a state that had already been in existence for same time (since 1948) when the Council was preparing the Declaration Nostra Aetate. The life of this state has certainly not been very peaceful, nor has it been peacefully accepted by other states, especially its neighbors in the Middle East; and in fact, this state had always been recognized as such, but did not have diplomatic relations with the Holy See, until 1993. Thus there were a number of political implications, and it was opportune and necessary to distinguish between the latter, which were perhaps the concern of the office of the Secretary of State, and the great religious tradition of Judaism that is so close to ours. This was the motivation behind the addition of the adjective religious to the name of the Commission, which in this way can be interpreted correctly. 3) The First Years of the Commission. Fr. Cornelius Rijk, despite the fact that he remained for some more time at his place at the then Secretariat for Christian Unity, was not chosen as first secretary of the Commission. The task was entrusted to another official of the same Secretariat, the already mentioned Fr. De Contenson, OP. He had the duty, as well as the honor, to get the new entity to work in its three-fold relation with the Roman Curia, with the universal Church and with the representatives of Judaism. For the first of these tasks, he received guidance and assistance from his superiors in the Secretariat, Cardinal Willebrands and Mons. Moeller. For the second, he could rely on the work already accomplished by Fr. Cornelius Rijk; the organs of consultation mentioned above were already in place, and Fr. De Contenson was also helped by a group of consultants who had been chosen among more or less well known experts on Judaism. For the third task, the establishments of these relations in the universal Church, he could count on different priests and lay people of different origin, who in various parts of the world were involved in the same work. Fr. De Contenson also had the great joy to witness the publication of the Guidelines and Suggestions prepared by Fr. Cornelius Rijk with the valuable and sometimes decisive assistance of the experts, and also approved by the various offices of the Curia  which must be consulted to publish documents such as that of the Commission  and which are then officially promulgated by the Holy See. Thus Fr. De Contenson, after Fr. Cornelius Rijk, laid the foundations, on which after him we have all been building until the present. If I remember him here in a special manner, it is because he dedicated himself so selflessly to his task, despite the fact that, among other commitments, he was also involved in the Leonine Edition of the works of Thomas Aquinas. Because of this overwork he broke down physically. After two years he died a saintly death, victim of two heart attacks. I heard that at his deathbed a confrère of his asked him whether in his work he had been assisted by the faith of Jews and Christians in the same Lord and God. Fr. De Contenson answered: oui, le même, mais avec une petite différence [yes, the same, but with a small difference]. We Christians believe in the Triune God. It is not necessary that I prolong this talk excessively so as to detail what the successors of Fr. De Contenson have been able to do. This is already contemporary history. For all that concerns my time as Secretary of the Commission, I wish to make three very brief observations. First: my appointment as the Commission's Secretary a result of the emergency created by the death of Fr. De Contenson. From one day to the next I found myself entrusted with this responsibility, with only a rather inadequate preparation, coming from my earlier work as secretary of the department of CELAM (the Latin American Episcopal Conference) devoted to ecumenical and interreligious relations, as well as my years as professor of Scripture and Hebrew language at the Faculty of Theology of the Catholic University of Argentina. More than ever did I realize how much I was in debt to all those who preceded me, as well as of how much could be done in the area of the relations between the Catholic Church (and in particular way the Holy See) and Judaism, an area which of all areas of pastoral work undertaken by the Church was (and still is) one of the most recent. [I have in mind] my predecessors as well as the experts who helped me, among whom [I wish to remember] Prof. Tommaso Federici, Fr. Roger Le Déaut and the Rector of the Pontifical Gregorian University, later Cardinal Carlo Maria Martini. Second: with their help and the understanding and the patient support of my superiors of that time, especially the vice-president Mons. Ramón Torrella, it was possible to arrive at the publication of a second document, which was more complex as well as more complete than the first, but which necessarily presupposes it: the Notes on the Correct Presentation of the Jews and of Judaism in Preaching and Teaching in the Catholic Church, promulgated on June 24th, 1985. I think that this document is still valid and helpful as it attempts for the first time, among other things, to explain the significance for us of the connection between religion, land and State, which is so crucial for the Jewish people and which they still so much emphasize. The two or three passages in this document that refer to this issue are the result of a fecund collaboration between the Commission and the Secretariat of State, which is always helpful for the work of the Commission. At that time, the Secretariat of State was under the direction of Cardinal Casaroli, as well as of Mons. 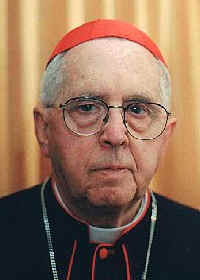 Silvestrini (now a Cardinal), to whom I wish to express my gratitude. Third and last: the visit of the Holy Father to the Great Synagogue of Rome, on April 13th, 1986, has been up to now one of the three decisive moments of his pontificate marking the history of the relations between the Catholic Church and Judaism. As we all know, the other two are the apostolic trip to Israel during the year of the Great Jubilee, with the prayer at the Western Wall, and the request of pardon for all the suffering that the Jews had to undergo at our hands during our common history. This, of course, without mentioning the establishment of diplomatic relations with Israel in December of 1993. The visit of the Holy Father to the Synagogue in Rome was an initiative of his with whose organization I found myself entrusted. And with this visit, during which I had the privilege of accompanying the Holy Father, my time at the Commission also ended: I had been consecrated bishop on the previous day, and I had been transferred to the Pontifical Council for Justice and Peace as its vice-president. The torch was thus passed on to other hands, which, as you shall hear now, have already had, and shall continue to have also in the future, the opportunity to continue and to broaden the work of the Commission for the Religious Relations with Judaism as long as the Lord so wishes. Or, perhaps better, until the Lord finally comes. At that point, this Commission shall have outlived its usefulness. Cf. the official communiqué in the Information Service of the Secretariat (today a Pontifical Council) for Christian Unity, 1974/3, p. 22: Taking into account the development of closer relations concerning matters of religion between the Catholic Church and Judaism and the Catholic Church and Islam, the Holy Father has decided to create two Commissions for relations with these religions. For the reference to Islam, see below. Cf. Acta Apostolicae Sedis 52 (1960), p. 436. , having in mind, of course, the approaching Council. Cf. also S. Schmidt Agostino Bea.Il Cardinale dellUnità, Città Nuova, Roma, 1987, pp. 351-357, esp. p. 355. This is not the place to discuss the difficult course of the Declaration in the pre-conciliar and the conciliar debates; for this, cf. Cardinal Agostino Bea, La Chiesa e il Popolo Ebraico (quoted in note iii), pp. 22-25. The future Declaration, initially suppressed from the program for the Council, was then placed after the fourth chapter of the draft of the future Decree on Ecumenism, and eventually it developed into an autonomous document during the second and the third session of the Council, thanks especially to the patient work of the same Cardinal Bea. Cf. also S. Schmidt, ch. 1 (note 2), pp. 564-613, whose report can be trusted as Schmidt was a careful historian and at the same time, as Cardinal Beas secretary, he was very close to the leading figure in these developments. Established with the Motu proprio of 05/19/1964, later established as an organism of the Holy See in Pastor Bonus, art. 159-162. Fr. Rijk began his contacts with an International Consultative Committee of Organisations for Christian Jewish-Co-operation in Vienna, on 12/6-8/1967. Cf. Information Service 1968/4, p. 13, with a brief report on the meeting. This was the case, despite the fact that already then existed so-called Amicizia/Amitié/Amistad/Freundschaft between Jews and Christians. It is however only after 1974 that Episcopal commissions for this purpose were established by Episcopal Conferences. The first official meeting of this organ with the Secretariat for Christian Unity took place between the 20th and the 23rd of December 1970. The two sides redacted a so-called Memorandum of Understanding to outline the content and the limits of the encounter from the point of view of both sides. Thus began the history of the International Liaison Committee between the Catholic Church and the IJCIC, whose meetings then continued more or less regularly until the latest (the 18th), which took place in Buenos Aires in July of the present year (2004). Cf. Information Service 1971/2, p. 11. The organisations represented within the IJCIC have a certain continuity, but they were never the same. Of significance, however, has always been the World Jewish Congress, whose president at the time, Dr. Nahum Goldman, Cardinal Bea had already encountered privately on Oct. 26, 1960, immediately after receiving from Pope John XXIII the task of handling the relations with Judaism (cf. S. Schmidt, Il Cardinale Agostino Bea (quoted in note ii), pp. 355-356, with the reference to the autobiography of Dr. Goldman himself). Cf. the text quoted in note i, with the comment of the same Information Service, pp. 22-23. Cf. Pastor Bonus, art. 162, as well as the text quoted in note i.
 Cf. for this the Information Service 1967/3, p. 24, with all its necessary clarifications, of which the most important is the following (explicitly theological) remark: 3) theologically, since the Church still considers the Old Testament as a sacred work inspired by God and forming part of the basis of her faith, this forms an essential link between her and Judaism which recognises the Old Testament as the ground for its existence. One could thus say that, from the theological point of view, the two religions are tied together at the very level of their religious identity. The terms are repeated in the Annuario Pontificio for the year 2004, p. 1718, where the Commission is presented. The text quoted in note i said The two Commissions (for Judaism and for Islam) come under respectively, the Secretariat for the Promotion of Christian Unity and the Secretariat for Non-Christians. Cf. number 25 of the 1985 Notes. ".